Abstract: Every five years, the French Ministry of Industry launches a study about the key technologies for the next five years. Knowledge capitalization was one of the mentioned technologies in 2000. This paper starts with the description of some problems forecasted at that time and the actual situation since. In this context, a definition for knowledge management is presented, and some related concepts are proposed. 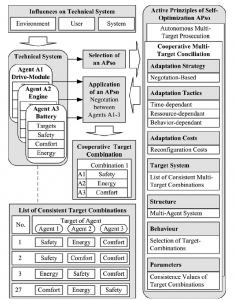 Finally, it is shown how the expert system technology associated with a cooperative design modeler allows the implementation of the knowledge management concepts. Knowledge may be universal, vehicular or vernacular. All people normally share universal knowledge. This is for example the case with geometrical knowledge. A specific actor who is only concerned with his or her own job only uses vernacular knowledge. It does not need to be shared. Vehicular knowledge is the type of knowledge which can be exchanged between two or more actors, allowing them for instance to perform collaborative design based on a common understanding. Therefore, the latter type of knowledge is very important for establishing a dialog between two partners. There is also a paradox to be surmounted: the safeguarding of know-how in time, while avoiding the risk of obsolescence of any part of the data. Within this view, Malhotra defines the old world of business as characterized by predictable environments in which focus is on prediction and optimization based efficiencies. This is the world of competence based on “information” as the strategic asset, and the emphasis is on controlling the behavior of organizational agents towards fulfillment of per-specified organizational goals and objectives. Information and control systems are used in this world for achieving the alignment of the organizational actors with predefined “best practices.” the assumption is that such best practice retain their effectiveness over time. In contrast, high levels of uncertainty and inability to predict the future characterize the new world of business. Use of the information and control systems and compliance with the predefined goals, objectives and best practices may not necessarily achieve long-term organizational competence. This is the world of “re-everything”, which challenges the assumptions underlying the “accepted way of doing things”. This world needs the capability to understand the problem afresh given the changing environmental conditions. The focus is not on finding the right answers but also on finding the right questions. This world is differentiated from the “old world” by its emphasis on “doing the right thing” rather than “doing things right”. KM is a framework within which the organization views all its processes as knowledge processes. According to this view, all business processes involved creation, dissemination, renewal and application of knowledge toward organizational sustenance and survival. This concept embodies a transition from the recently popular concept of “information value chain” to a “knowledge value chain”. What is the difference? The information value chain, considers technological systems as key components guiding the organization’s business processes, while treating humans as relatively passive processors that implement “best practices” archived in information databases. In contrast, the knowledge value chain treats human systems as key component that engage in continuous assessment of information archived in the technological system. In this view, the human actors do not implement best practices without active inquiry. Human actors engage in an active process of sense making to continuously assess the effectiveness of best practices. The underlying premise is that the best practices of yesterday may not be taken for granted as best practices of today or tomorrow. Hence double loop learning, unlearning and relearning processes need to be designed into the organizational business processes. Artificial Intelligence was a new technique which permitted the computer not only to solve equations but also to reason as an intelligent actor in order to solve problems or to give diagnoses. Prolog, Frames, Production Rules, and Case-based Reasoning are the new language used for the description of Expert Systems. 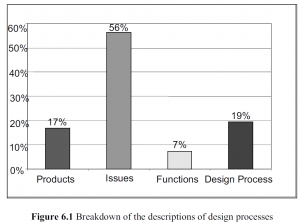 Abstract: This article presents a systemic method for designing assemblies. 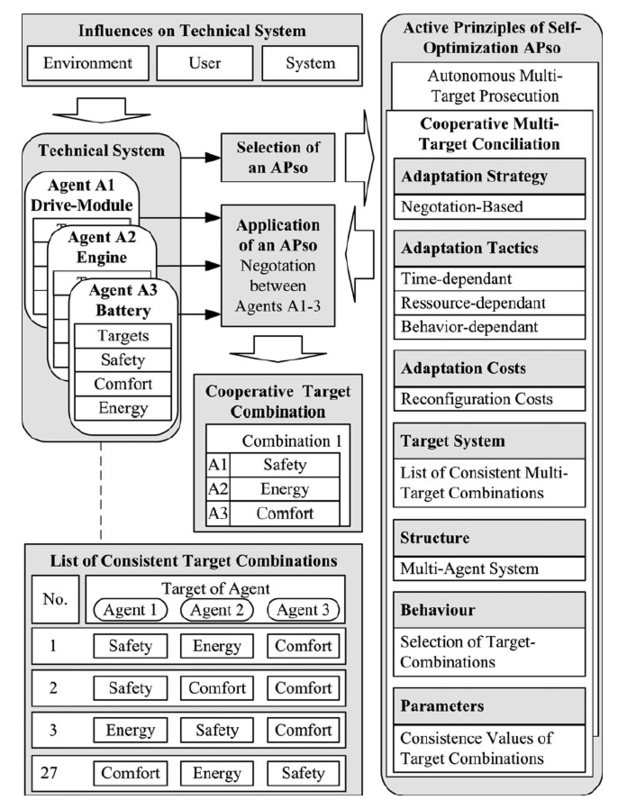 It is based on generic concepts such as modeling of assemblies using assembly nested graphs which reflect the product design breakdown, the interfaces between components. The proposed method enables to assess the product producibility and the robustness of the assembly process. It eases impact analysis following changes of modified product functions or features. A software tool, called GAIA, has been developed to support this method; based on a user-friendly interface. It enables specifying assemblies through interfaces and performing a functional and structural analysis of assemblies. Interoperable with the Digital Mock-up and Product Management Systems, it speeds up design changes and impact analysis. Finally, it is useful to grasp the design intents and to capitalize and reuse this design knowledge. The adoption of this advanced modeling technique in support of the engineering assembly process improves the quality of designed products and reduces the cost of change management, customization and fault rectification by solving assembly issues at the design stage. Traditional Computer Aided Design tools (CAD) help designers to set up product geometrical definitions. However, these tools do not easily capture designers’ intent as it should be needed in order to record the functional specification cascade with respect to the product’s breakdown. For complex assemblies, the main hurdle that prevents designers from understanding the results of systemic analysis deal s with the lack of representation over the product 3D geometry of both functional requirements and interfaces between components. The EADS Corporate Research Centre has developed a new design tool to support the method presented. 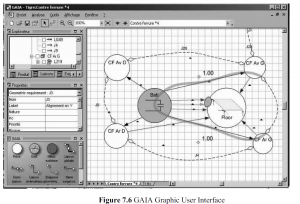 This innovative piece of software is called GAIA which means Graphical Analysis of Interfaces for Assemblies. This software tool enables to grasp the design intent, the product structural and functional interfaces and the manufacturing process decisions with a user -friendly graphical user interface (GUI). The corresponding product-process specifications can be exported to various product life-cycle management (PLM) and PDM systems. 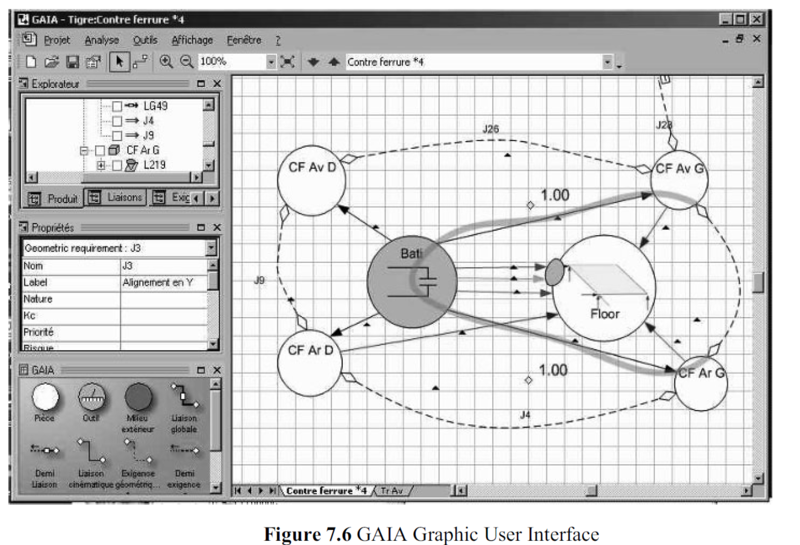 GAIA, coupled with CAD and Computer Aided Process tools (CAP), enabled iterative design from GAIA specification to CAD/CAP definition and back. GAIA makes it possible to capitalize and reuse design knowledge about assemblies. The evaluation of the functions taxonomy suggested a need to combine the function taxonomy with a product and issues taxonomy to avoid loss of information.